This weeks stitch comes from My Knitting Book, by Miss Lambert, which was published in 1845. There is no real name for this stitch. The book simply calls it "A pretty stitch for a purse". Good enough for me! This stitch does look awfully familiar to me though. I briefly went through a few of my stitch books and posts on this blog, but couldn't find it. It's possible I am wrong, but I could swear I know this stitch! Perhaps there is a similar stitch I am thinking of, not this particular one. 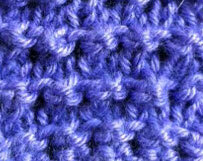 If anyone recognizes this stitch, please let me know. I am curious to see if this has a name in some other book. UPDATE 11/5: jessontube1 has found the stitch! 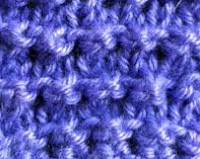 It is pebble stitch, which I posted back on May 4, 2011. Sorry for the duplicate, all. I will try to get another one up tomorrow - one that I haven't posted already! **Second Update 11/6: I happened to come across a very similar stitch in The Big Book of Knitting Stitch Patterns, but called Knotted Stitch. And of course, here is the video. Enjoy! It is amazing: written down such a long time ago and now the stitch has its own video on youtube. Thanks for showing. I failed on trying to post this comment on youtube. Don't know why. I love looking at the old books and newspapers - and then I look in my stitch books and find them under a different name (or two). It is amazing that they have survived all these years :0) If you look on Google books, there are quite a few old books that have oodles of stitches and garments. It takes some getting used to the abbreviations they use, but they are all usually pretty well explained somewhere at the beginning of the books. Just found your video, I picked up a golden hands pamphlet that called this stitch the pimperenel, it shows off different colored rows very well! Can I see the picture?